In this article, I’ll walk through creating a simple SPA app. Along the way, I’ll introduce some fundamental concepts for building SPAs, including the Model-View-Controller (MVC) and Model-View-ViewModel (MVVM) patterns, data binding and routing. 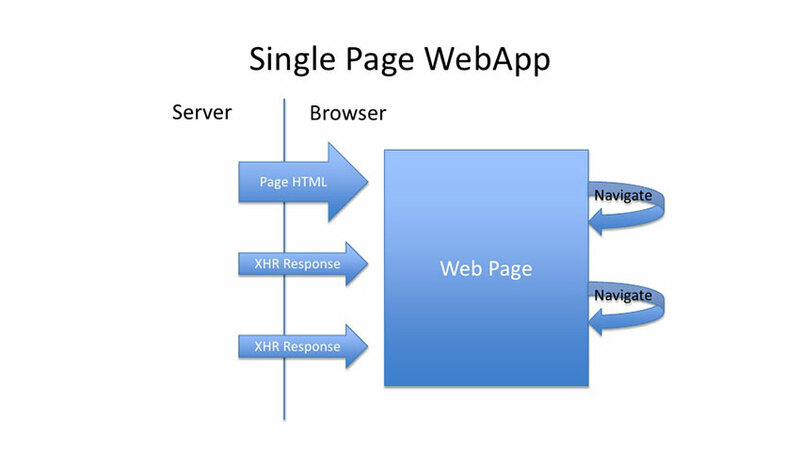 Single Page Application is good for making Responsive Websites, Support mobile, Tablet & Desktop. No extra queries to the server to download pages. Performance improvement, Single Page Application can improveperformance in many ways, Single time file load each of HTML, CSS, JS. •	Security: Compare to traditional page Single Page Application is less secure due to Cross-site scripting (XSS). Applications are more fluid and responsive, without the jarring effect of reloading and re-rendering the page. Another benefit might be less obvious and it concerns how you architect a Web app. Sending the app data as JSON creates a separation between the presentation (HTML markup) and application logic (AJAX requests plus JSON responses). This separation makes it easier to design and evolve each layer. In a well-architected SPA, you can change the HTML markup without touching the code that implements the application logic (at least, that’s the ideal). You’ll see this in action when I discuss data binding later. With this architecture, the client and the service are independent. You could replace the entire back end that runs the service, and as long as you don’t change the API, you won’t break the client. The reverse is also true—you can replace the entire client app without changing the service layer. For example, you might write a native mobile client that consumes the service.